If you ever asked yourself, what else your pizza dough (or mine) can do for you, then I have just the answer. You can use it to make pretzels, or you can use it as a simple flatbread, loaded with healthy and less healthy ingredients. This week we tried making something with more fruits and greenies, suitable for breakfast or even lunch. I don’t know if you can really call this a pizza, it doesn’t have sauce or even mozzarella, instead it is loaded with prosciutto and Asiago (my faves) and they are perfectly sized to wolf them down in less then five minutes. In fact, I drizzled a bit of BBQ sauce here and there but that might not be suitable for breakfast, unless you woke up around noon :). I guess you could probably replace it with a bit of honey or better yet, maple syrup, or just leave it like that, though it might be a bit dry, up to you. As far as I’m concerned, I really enjoyed them and if you are not watching your weight in any way, make sure you make more than just the two, they go fast. Have fun! Preheat oven to 500° F / 260° C, shape your flatbreads and baked them for 1-2 minutes or until they just start to get a bit golden. Remove from oven and turn heat down to 425° F / 220° C.
Top each flatbread with ½ cup of shredded Asiago cheese. 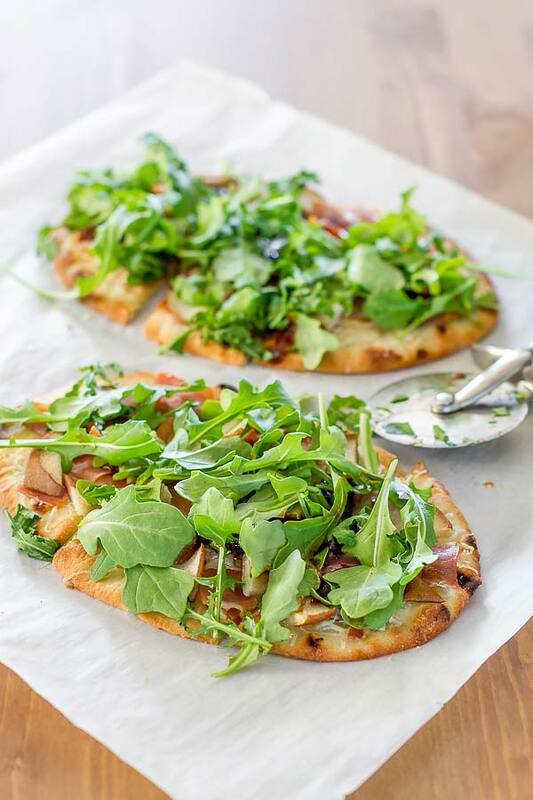 Arrange the prosciutto slices evenly over each flatbread then top with slices of pear. Bake for another 5 minutes or until the flatbreads turn brown...ish. 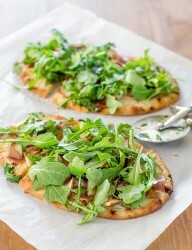 Top each flatbread with ½ cup of baby arugula, slice and serve.